SON, THE NETHERLANDS--(Marketwired - Sep 21, 2016) - Promise Technology announced that its Vess A2330 and Vess A3340 network video recorders (NVRs) have been certified by Milestone Systems for use with the whole range of XProtect® video management software (VMS) products. Both the Vess A2330 and A3340 easily supported the benchmark video data throughput levels as recommended by the Milestone Server and Storage Calculator. In maximum performance testing, it was further determined that the Vess A2330 and A3340 NVRs can support twice the number of cameras as recommended by the calculator. Promise was one of the first hardware vendors to be certified in 2014 by Milestone, the number one global VMS provider according to IHS Inc., and by qualifying the new Vess A2330 and A3340 NVRs with XProtect VMS it provides customers with more possibilities to solve their security challenges. The Milestone certification process tested the solution's functionality, performance impact and usability. The test results ensure that integrators and end users designing, installing and operating surveillance systems which incorporate Vess A-Series NVRs and XProtect VMS can have confidence that the system will record and archive video reliably. "Promise Technology has certified their complete range of Vess A-Series NVRs through the Milestone Systems certification program. The system performs at a high level of data throughput, and with good read/write latency when using the optimal logical disk configuration. Customers who wish to gain the maximum value and performance out of their surveillance system can also refer to the best practices and performance limitations outlined in the certification documents provided by Promise Technology and Milestone Systems to help design a system," said Trine Voss, Head of the Solution Partner Program at Milestone Systems. "The joint efforts between Promise Technology and Milestone Systems to deliver surveillance solutions to the market that are validated and optimized for integrators and end users is a result of a strong strategic collaboration between our companies." 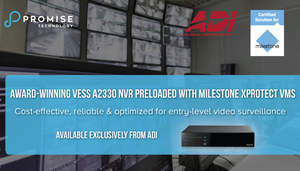 Promise Vess A2330 is now available from ADI Global Distribution with XProtect VMS preloaded and optimized for entry-level video surveillance deployments. Cost-effective, scalable and reliable, the Vess A2330 NVR with XProtect VMS solution offers superior performance for banking, retail, gas stations or any business where security is a concern. Promise is releasing the Vess A2330 and XProtect VMS solution exclusively for ADI, a leading global wholesale distributor of the latest security technologies and brands. "We are excited about the brand and look forward to working closely with Promise Technology," said Gordon Moore, Country Manager, ADI Global Distribution. "We believe this is the affordable server/storage solution the market has been looking for to complement our VMS and camera offerings." "We believe it is very important to work closely with our ecosystem partners and our extensive network of Promise qualified distribution partners so we can validate, qualify and document the performance of our solutions to minimize risk and optimize performance," said John van den Elzen, General Manager, Surveillance Business Unit, Promise Technology. "It's really exciting to collaborate with Milestone and ADI to provide our shared customers with a solution that offers an outstanding combination of price, performance and service."